On Thursday, Jan. 17, the Georgia Tech Police Department (GTPD) held this semester’s first Ride Smart bike and scooter safety class. 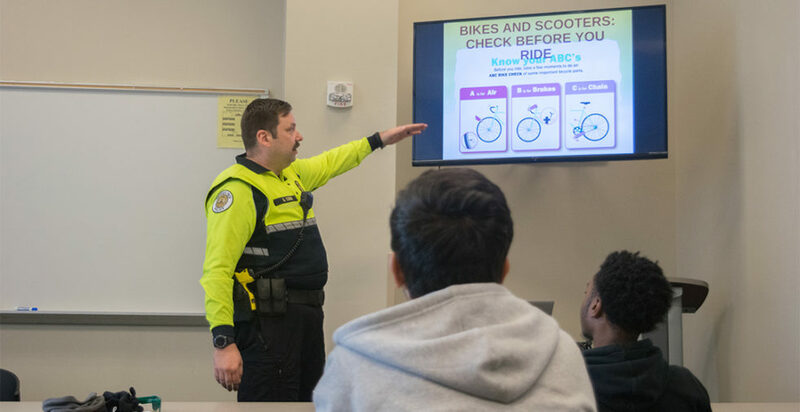 While hosting bicycle safety classes has been a long-running GTPD practice, it was only late last semester that information on scooters was added to the presentation, according to Officer Gary Cook, who led the Jan. 17 class. A sprinkling of students was in attendance, multiple in order to gain extra credit for their APPH 1040 Scientific Foundation of Health course. “The city kind of took a stance on the scooters, because a lot of cities were being overrun, overwhelmed by the scooters, so there [are] some laws that came into effect that applies to scooters,” Cook said. The class was held in a Campus Recreation Center (CRC)classroom, where Cook stood in front of the rows of students and explained slides chock-full of tips mostly related with how to ride, handle, and park bicycles. Despite flyers advertising the class partially as a scooter class, there was relatively sparse information on scooter safety. Becky James, a trainer who works at the CRC, chimed in from the back with some guidance. “Part of the ordinance the city council has brought down, and they’re doing it in cities surrounding here also, are where you need to park these scooters,” James said. James and Cook explained to students that GTPD placed across campus small signs that indicate recommended locations where students should park their scooters. Most of the signs told students to place their scooters beside, but not in, bike stands. “Just be courteous,” Cook said. “I think a lot of those signs have disappeared,” he added, chuckling. Cook reminded students of the most important thing to check before you jump on to ride a scooter: the brakes. Scooters are subject to the same general rules as bicycles according to the law, and, similar to bicycles, are treated as vehicles. For example, scooters are not allowed to ride on sidewalks, but Cook said that they as with bicycles are of course allowed on the mixed pathways throughout the interior of campus. Additionally, he noted that on some of the more dangerous roads around campus, Cook said even he sometimes rides on sidewalks.